Now Christmas and the New Year festivities are over and done with, Winter can seem rather dull and depressing. It’s often a challenging time for parents as it can be tricky to find things for the kids to do, particularly if the weather’s snowy or rainy. Nobody likes being cooped up inside, after all! We’ve come up with some simple and cost effective activities that you can enjoy with your children such as having a duvet day, puddle-jumping (if you don’t mind cold and muddy children) and winter treasure hunts! Some of these are indoor activities, while others will need you to don your wellies and warm clothes and head outside, but we guarantee the kids will love them all! What Can You Do with Kids at Home in Winter? If you’re looking for fun indoor activities for the kids during winter, why not try some of these winter craft ideas? They’re fun, creative and just a little bit messy! If you have young children who need a hand with their alphabet or spelling skills then Alphabet Bingo is sure to go down a treat. By writing letters on a few pieces of paper (make these look exciting with multi-coloured pens and glitter-glue! ), handing them out to your children, and giving them some sort of marker, you can easily create a brilliant learning game. Winter doesn’t necessarily mean snow, so what can you do on a winter day when there isn’t any snow to play in? Make your own snow! It’s a safe and fun way to encourage sensory play with the added bonus of no frostbitten children! Mix 3 cups of baking soda with half a cup of conditioner and hey presto! You have snow. To keep the snow looking authentic, make sure to use white conditioner, although, if you’re feeling jazzy, make batches of different colours (if you have colourful conditioner lying around). You could add a few drops of food colouring if you wanted something really bright! Snowman bowling should definitely be on your things to do in winter list! Not only is it bound to create a good few hours of fun but it’s a fun indoor winter activity the whole family can enjoy, not just the kids! Start by getting your children to create snowmen out of toilet roll tubes or kitchen roll tubes (cut in half). This can be done with paint or colourful marker pens. Then use something like a marble or small, soft ball (we don’t want any damage to floors or household furnishings!) to act as the bowling ball. To make the game even more fun, keep score and play adults against the children – a bit of family rivalry never hurt anyone! If you don’t fancy getting crafty, head to the local library – they may have some fun kids’ events on, or just grab some exciting new books. Or why not visit a museum? Most of them are free, after all, and everyone will learn a thing or two! What Can You Do Outside in the Winter? Finding things to do with kids outdoors in winter is sometimes a struggle. A lot of outdoor-related places are closed during winter and if you’re lucky enough (or unlucky depending on your preferences) to have snow, it may be difficult or too dangerous to get to places with your children. If you have just the right amount of snow for a winter-themed nature walk then this is always a good way to have some fun outside whilst shedding a few of those naughty pounds you may have put on from any Christmas festivities. Create a checklist of things you may find on a winter nature walk, such as: animal footprints, icicles, pine cones and frozen puddles, and the children can tick them off as they walk. Games like these make outdoor winter activities for kids so much more enjoyable. Winter craft ideas for kids can be great indoors, but they also work for the outdoors too! Get crafty with some twigs and stones and create an outdoor fire pit to roast marshmallows in. Or have a snowman-building/dressing competition. If it’s snowing too heavily for a fire then create a snow scene in your garden by creating snowmen around a firepit (but you won’t need to light it!) and for extra adult fun, create some of the snowmen melting due to the heat from the fire – this could also act as a great way to teach your children about snow, what happens to it when it gets warm? How is snow formed? A day out at your local ice rink or tobogganing centre may cost you a little bit as opposed to all the activities that you could do for free but it gives you something to do that is still fun, still winter related and gets you out the house for a little while! What Can You Do on a Snow Day? When you think of things to do on a snow day, the obvious answer is play outside in the snow! A lot parents prefer their children to go out and get wet and mucky having fun instead of sitting inside on their games console or tablet! 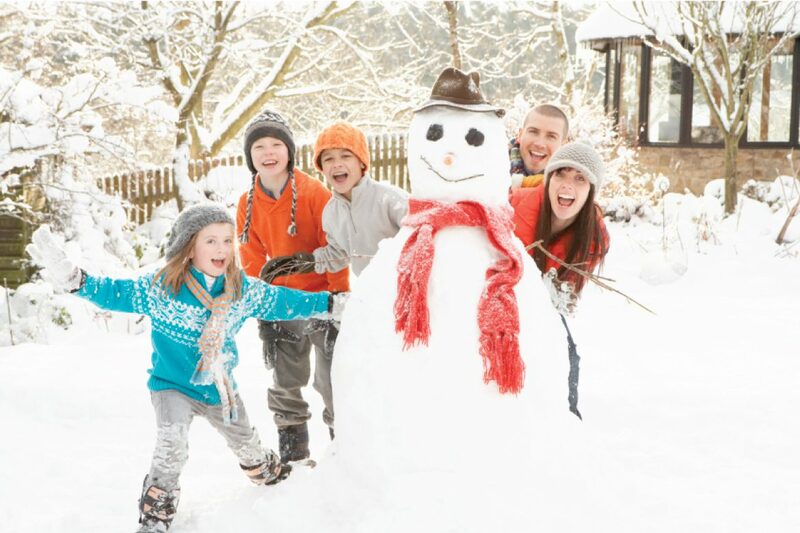 The best way for your children to enjoy the snow is simply snow day activities such as snowball fights, building snowmen and creating snow angels. But what other kids snow day activities are there? Go animal hunting (not literally hunting) in your back garden. Find animal tracks in the snow, take pictures of the footprints and look them up online when you get back in the warmth of your house with a hot chocolate! It’s a great way to learn as well as have fun. Set up camp outside and paint the scenery! Remember to wrap up warm though as you could get pretty cold. Or the second option, paint the snow! Literally paint the snow. Grab some bowls, buckets and/or spray bottles and fill them with water and a couple of drops of food colouring. When you have your array of colours, start throwing, spraying or dripping your concoction onto the snow – we guarantee you’ll have the jazziest garden on your street! If you want to go out and about this winter then try searching for ‘free winter activities near me’ you’ll find an array of things that you could do away from the home that will keep your children entertained for while – even if it is sledging at your local park! Whether you have young children or early teenagers, we’re sure you can find something fun-filled and purse-approved for those cold and wet days during this winter season. With the weather getting colder, you may opt for indoor activities but if your youngsters enjoy playing outside, or you simply want to get them away from their technology, then venturing out on winter walks is a great (and healthy) option. Whatever you do this winter, if you’re heading outside, make sure you wrap up warm. We’ve got wellies for all the family (including kids’ wellies featuring their favourite characters), and also scarves and gloves to keep necks warm and fingers toasty. Or, if you’re thinking of a duvet day, why not kit out the whole family in some nice new cosy slippers?